Istanbulkart, also known as Istanbul travel pass, is a contactless electronic card that is used in public transportation in Istanbul. It is well worth it, if you want to travel within Istanbul a lot. Istanbul travel card, Istanbulkart, will reduce your transportation costs immensely. As of 2018, Istanbulkart is 6 TL. You can buy it at both of the airports. In Istanbul Ataturk Airport (IST), you can get the card at the metro station (just follow metro signs in the airport). In Sabiha Gokcen Airport (SAW), you can buy your metro card from the kiosk across the street from the domestic flights exit of the terminal. If you want to have an extensive information about Istanbul airport transfer, you can read our article about the transfers from/to Istanbul airports here. As a side note, you might see "Akbil" signs on the stores. Akbil is the older version of Istanbulkart, and it is not sold anymore. What the vendors really mean is Istanbulkart. Some people just use the term “akbil” instead of Istanbulkart due to old habits. After buying your card, you need to load credit into it. HAVABUS (HAVAS/HAVATAS formerly) airport shuttles also accept Istanbulkart besides cash but you cannot pay cash in public transportation. You need to either have Istanbulkart or electronic tickets, but Istanbulkart brings more value for your money than electronic tickets. With Istanbulkart, you can transfer to other public transportation vehicles at discounted rates. In order to benefit the reduced transfer fares, you should switch the transport vehicle within 2 hours. Istanbulkart and electronic tickets are also sold at automatic vending machines, ticketmatics, IETT counters, kiosks/private vendors throughout the city at several locations (approximately 2100). Just watch Istanbulkart sign, then you can buy and refill your card easily from those point of sales. IETT (Istanbul Electricity, Tramway and Tunnel) is the establishment that coordinates public transportation in Istanbul and is under the supervision of Istanbul Metropolitan Municipality. There is no discount for transfers from other public transportation vehicles to Metrobus. However, you will get discount if you transfer from Metrobus to other public transport vehicles. Do not forget to validate your Istanbulkart on refund machines at the exit, if you are traveling with Metrobus. If you do not revalidate your card at the exit, you cannot get distance surcharge back. Distance based fare for Metrobus is not valid between midnight and 6 am. 40+ stops ticket price is valid during that time. Ferry lines are managed by a private company Şehir Hatları. Ticket prices might be different than IETT'S and ticket fares change depending on the route. 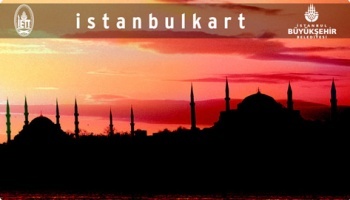 If you want to budget-travel Istanbul, Istanbulkart (Istanbul Travel Card) is a must-get card. May I know if I can buy the Istanbulkart as well as topping it up with credit card instead of cash? At this time, vending machines do not accept credit cards. Maybe some vendors can accept credit cards with extra commission, but it is best to have cash beforehand. What about AKBIL ?? Isn’t it used anymore nowadays!? Or is it the the same? Akbil is the older version of Istanbulkart, and it is not sold anymore. You can still see “akbil” signs on the stores, but what they really mean is Istanbulkart. Some people just use the term “akbil” instead of Istanbulkart due to old habits. So, can we charge Istanbulkart from Ikbal stores? If not, from where can we do that? Also, is it available to pay Istanbulkart from Ataturk airport? Last q, can we use this card as a family (we are 2 adults and 4 y o child)? Thanks for the post, it’s clear and insightful. My brother and I will be in Istanbul in two weeks-time. We’re interested in using the Istabulkart to get to our hotel, in Besiktas. I see you mentioned “Havabus”. What are their rates, and do we need to book them in advance? where to buy Istanbul Card in international Airport ? Location? Just follow the metro sign at the airport. I have put TL 100 in my Istanbulkart (by mistake), now there is still TL 90 left and I have to leave after tomorrow, is there a way to claim the refund for this balance amount left? There are 2 of us travelling. Do we need 1 istanbulkart each or we can share it? Of course you can share it, but if you use one card, you will only be able to take advantage of the discounted transfer rates for one card. If you use the card the second time for a transfer, it won’t count as a transfer, the full amount will be deducted from the balance of the card. Can I buy initial ride and 1st transfer and use it for metro and then change to bus? Please I need to buy Istanbulcard in the airport ataturk? Bonjour nous sommes un couple qui veut partager la carte et qui se deplace ensemble. Si nous utiliserons la carte a chaque fois cad qu’on va la passer 2 fois .comment justifier en cas de controle au controleur apres le passage de la 2eme personne?? is there any way to use unlimited transportation instanbul? We are travelling with kids. From what age are you charged on your card? Hi guys I’m going to Istanbul in a few days, I already have an Istanbulkart and I would like to know is how much does the fare cost (2018) from Atatürk Airport to Sultanahmet for three persons? 4 nap múlva utazom Isztambulba. Átvennék bárkitől Istanbulkart-ot, hogy ne kelljen érkezéskor ezzel bíbelődnöm. Ha van rajta összeg annál jobb. Sürgős! At Airport, Can I use credit card to purchase Istanbulkart? Thanks! Hi that was a great post Could you tell me if I could use Euro or INR or USD to buy the Istanbulkart since I am not carrying any Lira? What is the best way to get the card? if I go from Attaturk international airport to kodikoy how much balance or credit is required in Istanbul card I wait for your response.